What do Michael Brown, Eric Garner, Trayvon Martin, Officer Wenjian Liu, and the Rev. Dr. Martin Luther King, Jr. all have in common? Today is the day when we commemorate the forging of a path that led toward freedom for all. Nearly 50 years ago, Rev. Dr. Martin Luther King, Jr. did the unthinkable in helping hundreds of thousands of people experience the unimaginable. There’s no question that he played an historical role in moving The United States away from its painful past and closer to a world in which men, women, and children of any color can stand together free from oppression, fear, or loathing. Yet this year — and every year — we’re reminded that the movement King led during his too-brief life is far from over. We all remember the accounts of Ferguson, Mo. and Michael Brown; New York City and Eric Garner; Sanford, Fla. and Trayvon Martin, and the recent murder of the NYPD’s own Rafael Ramos and Wenjian Liu. All of their deaths were senseless, all made international news, and all served as nightmarish reflections on the face of Dr. King’s dream. Today, The New Yorker decided to connect them all together — literally arm-in-arm. Even if you’ve never read The New Yorker, there’s no denying that it’s one of the few publications whose covers still turn heads. Some feature iconic images while others are simply professional illustrations — but they all show evidence of the artists’ adroit precision in putting pencil and brush to paper. A few, like last week’s honoring Charlie Hebdo, are the things of which Peabody awards are made: statements so big they don’t need words. It’s a portrayal of Dr. King’s historic march on Selma, Alabama (as seen in theaters now) — but instead of King and his ardent supporters walking side-by-side across the Edmund Pettis Bridge, we see (from left to right) Eric Garner, Trayvon Martin, Dr. King, Michael Brown and NYPD Officer Wenjian Liu walking under a shared American flag. “It struck me that King’s vision was both the empowerment of African-Americans, the insistence on civil rights, but also the reconciliation of people who seemed so hard to reconcile. Is this artistic liberty or something more controversial? 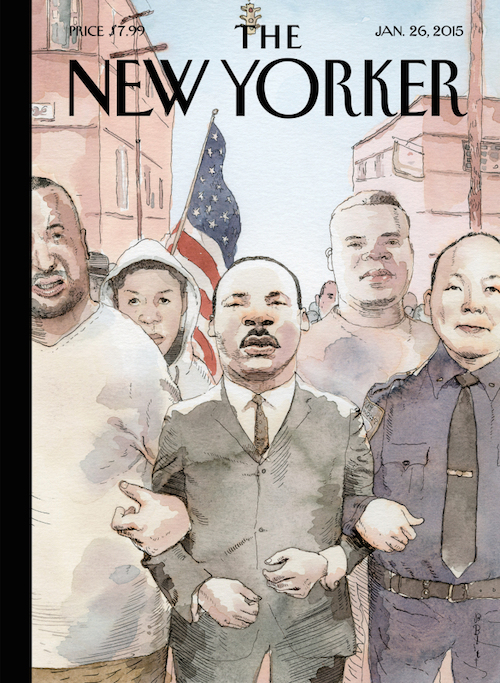 Whatever your thoughts on Blitt’s work, his cover makes you think — which means it’s accomplished its goal of connecting today’s headlines to those of a not-so distant past. King himself almost certainly would have appreciated the sentiment.